Jean de Brunhoff was a French writer and illustrator, known for creating the Babar books, the first of which appeared in 1931. A lavish look at the work of the father-and-son creators of Babar, the little elephant. Babar’s children hear of Father Christmas who brings joy and toys to little children. Can Babar find a way to bring him to the Elephants’ country? Babar and Celeste have triplets. The smallest, Alexander, has a knack for getting into predicaments. Babar’s friend Zephir the monkey is certain that he can save Isabelle the monkey princess. But he needs the help of a tiny mermaid named Eleanore. Babar and the elephants build a beautiful and happy city called Celesteville. But one fateful day a snake arrives. To celebrate Babar’s 60 years in America, this handsome anthology of six best-loved stories is reissued. In 1931 Jean de Brunhoff created Babar, a little elephant who walked out of the jungle and into the hearts of readers the world over. 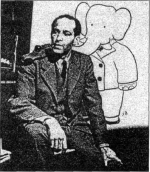 Widely recognized as the father of the picture book, Jean de Brunhoff wrote and illustrated six Babar stories before his early death in 1937. Every word and every picture of these classics is included in this big, inviting gift edition. This anthology includes The Story of Babar and Babar the King. While on a holiday at the seashore, Zephir accidentally catches a mermaid. The title of the American edition was later changed to Babar and Zephir.